Begun in 2008, the annual series Wilde Stories has striven to provide the best in gay speculative fiction (much as its companion series Heiresses of Russ strives to do for lesbian speculative fiction). 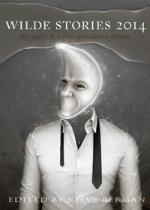 The latest installment in this series contains fourteen selections published during the calendar year 2013, which first appeared in other anthologies, literary magazines, and three first appeared online (two at Tor.com). Both female and male writers are represented. In his introduction, Berman notes that this installment happens to contain only writers who have never been published in this series before: a sign that perhaps the field of gay speculative fiction is expanding. Berman certainly has an expansive definition for speculative fiction: four are outright horror, several more blur the line between horror and dark fantasy, most seem set in some version of our world (two are clearly set on another world), one is a historical fantasy, and one is steampunk. Several of the stories defy easy classification, straddling different sub-genres, and a couple do not even strike me as obvious speculative fiction. The only common thread among all the stories is that at least one character is a gay male; otherwise there is no common theme shared by all the selections. However, the anthology is weighed heavily towards horror and dark fantasy (not surprising, as Berman is well known as a writer and editor of horror). An especially chilling example, “Grindr,” by Clayton Littlewood, opens the anthology. “How to Dress an American Table” by J. E. Robinson and “In the Brokenness of Summertime” by T. W. Clinger produce similar chilling stories, but without obvious fantastical elements. Vampires (“Seven Lovers and the Sea” by Damon Shaw) and zombies (“The Revenge of Oscar Wilde,” by Sean Eads, which–aptly–closes the anthology) also make appearances. “The Ghosts of Emerhad” by Nghi Vo, despite its title, is not a typical ghost story, except insofar that the protagonist is haunted by the memories of long-ago war. While I am not an aficionado of horror, I cannot deny that the horror stories included herein are either disturbing and/or haunting, without resorting to gratuitous violence. Standouts include “Caress” by Eli Easton and “The Water that Falls on You from Nowhere” by John Chu, both of which also include romantic elements. Both are also among the most obviously fantastical: Easton’s touching story demonstrates that even a man with a mechanical heart may love, and the title of Chu’s story refers to the results of telling a lie. (Why water should appear out of nowhere to drench a liar, or how this began, is never explained; it is simply taken for granted.) Whereas many of the other stories include a gay character matter-of-factly, in Chu’s story it is much more integral to the overall plot, as he explores how family dynamics continue to impact (and may even surprise) us. “Superbass” by Kai Ashante Wilson deserves special mention, as it, of all the stories included, most pushes the boundaries of possibility: not in its portrayal of magic and witchcraft, but rather in the potential of human experience. Wilson presents the relationship between the two male protagonists, Gian and Cianco, as a matter of course, but then shows that many of the other characters are involved in group marriages (Gian, for example, has two fathers and one mother), which further complicate/enhance family dynamics; quite possibly their relationship will expand to include another woman or man. I read this anthology straight through, which is not how I typically read anthologies: usually I read favorite authors first, and then follow up with the writers unknown to me. Neither way is preferable, of course; I encourage all potential readers to explore this sampler of gay speculative fiction in whatever fashion suits them.